Lately you've been getting into that rockabilly style. Those 50s styled dresses with bright vivid colors, and your beautifully curled hair pulled back with a handkerchief. Your colorful tattoos proudly on display, contrasted perfectly with the dark black of your smart halter-top dress. You like the freedom of being who you are, while wearing a dress typically worn by women who had little freedom. It's liberating. But you want a little extra flair. Something to make your outfit pop just a little bit more. This Polka Dot Scarf goes great with the rockabilly aesthetic. Wrap it delicately around your neck or tie your hair back with it for a day out on the down. Either way, this will make your whole outfit come together with that classic 50s feel. Just don't take any nonsense from someone telling you to go make them a sandwich. You may dress like you're in the 50s but it is the 21st century, and you are a strong independent woman. This is a very tiny scarf. I guess it is my fault for not reading the description properly, but I was expecting a much longer scarf. 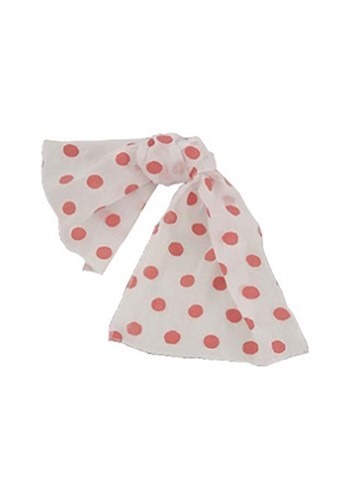 I ordered this scarf thinking it was white with white polka dots like in the picture. It was actually white with red polka dots.